Syntax of C# DateTime Format. This blog describes how to format DateTime in C# with code sample. The DateTime data type is used to work with date and times in C#. The DateTime class in C# provides properties and methods to format dates in different datetime formats. 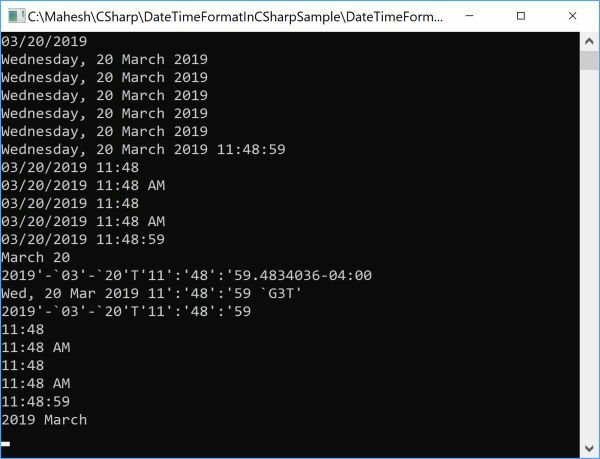 This article explains how to work with date and time format in C#. The following table describes various date time formats and their results. Here we see all the patterns of the DateTime Class. d -> Represents the day of the month as a number from 1 through 31.
dd -> Represents the day of the month as a number from 01 through 31.
ddd-> Represents the abbreviated name of the day (Mon, Tues, Wed etc). dddd-> Represents the full name of the day (Monday, Tuesday etc). h 12-hour clock hour (e.g. 4). f Represents the most significant digit of the seconds fraction; that is, it represents the tenths of a second in a date and time value. fff Represents the three most significant digits of the seconds fraction; that is, it represents the milliseconds in a date and time value. ffff Represents the four most significant digits of the seconds fraction; that is, it represents the ten thousandths of a second in a date and time value. While it is possible to display the ten thousandths of a second component of a time value, that value may not be meaningful. fffff Represents the five most significant digits of the seconds fraction; that is, it represents the hundred thousandths of a second in a date and time value. ffffff Represents the six most significant digits of the seconds fraction; that is, it represents the millionths of a Second in a date and time value. fffffff Represents the seven most significant digits of the seconds fraction; that is, it represents the ten millionths of a second in a date and time value. Here is a complelete C# code sample uses these formats. // Get current DateTime. It can be any DateTime object in your code. Above code sample generates the following output.